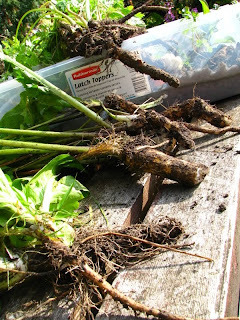 The Edible Eden: Fun with White Roots! I'm keen on root crops in fall and winter. Most root crops are meant to be cooked: taro, sweet potatoes, potatoes, yams and arrowhead all have anti-nutrients in them or enzymes and chemicals that make them toxic or pretty nasty to eat raw. I've known people who ate potatoes and yams raw, but they are both so full of starch as to be pretty slimy and vile. I eat plenty of carrots and dark greens, so I walk around with orange-ish palms anyways, so I don't worry about how much nutrition to get in root crops. I want bulk, carbs, and that full feeling that you can't get from most veggies. I also have the taste buds of a child, so I'm not keen on strong-tasting food. 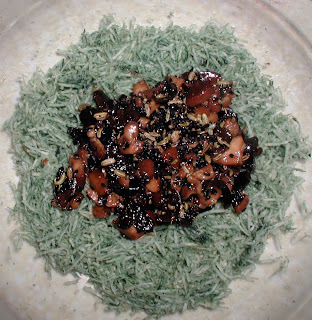 I'm enticing you with this picture of a mushroom dish on some celeriac that I colored with a dab of spirulina to show you that white roots can be fun, even for kids. Queens of the roots are the umbel family. They've been domesticated for hundreds of years as to not look like these wild roots here. But if you are running around in the wilderness in winter and KNOW your umbels (remember hemlock is in this family) you can get a pretty good meal out of even roots like this. But umbels love the mud, the muddier, the better. I'm showing you these roots in a more natural state to show you that the grocery cleans them up (A LOT) before they put them on their neat shelves. If you grow umbels, they want mud, well not all mud, but light, almost sandy soil that is constantly moist. Any drought, any check in the moisture and those lovely carrots will be BITTER. And umbels can get mighty bitter. They can also be pretty strong, so taste them before you go crazy with them. If you grow them, they want coddling, unlike some other roots that are more forgiving of bad climate. Umbels with edible roots number in the hundreds. But here are the more common ones you can find in the grocery: carrots, celery, celery root (celeriac) parsley, parsley root, dill, caraway, cilantro (leaves) and coriander (seeds), anise, fennel, bulb fennel (finocchio), and parsnips. If you have enough beta carotene and want to try a sweet variety of carrot, go with white. White carrots tend to be sweeter than orange and much sweeter than red or yellow carrots. They also seem more resistant to the bitterness of the colored carrots. When you eat raw, you really notice things like bitter carrots. (I love this cat.) Here is a pile of white carrots courtesy of the web (I'm using some of these photos that are not mine to show you what these plants look like.) You can see that white carrots look very much like parsnips. But, big taste difference. All the roots of the umbels above are edible, some very good. Fennel root is as good as fennel stalks. People use them mostly in soups, but I just like eating them for a crunchy treat out of hand or grated up in some experiment. Most moderns don't know that the roots of parsley are good. I like growing veggies that have multiple functions. Carrot tops are good when young, and some varieties of parsley have good roots like this small one here. 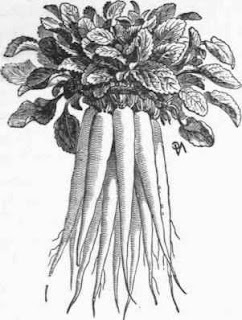 The large root is a parsnip. 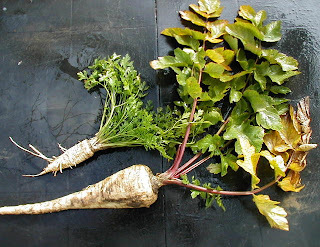 Note that the leaves of parsnips are NOT edible. Many umbels can cause dermatitis in some people, anywhere from a mild rash to a serious case like poison oak. If you get rashy after you've been pulling carrots, use a gentle soap right after you deal with the greens and don't eat them. Parsnips greens will give many people a rash, which is why they cut the tops off in the stores. 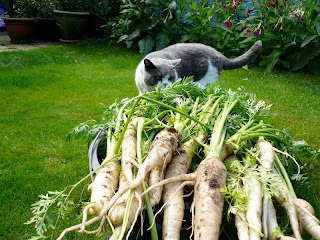 But parsnips are wonderful in raw dishes. They have a spicy, sweet taste that goes well in many dishes. Experiment! 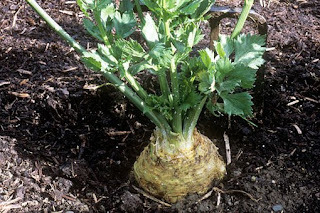 But my favorite of the root umbels is celeriac. It's grown in muck and highly sprayed. NEVER buy and eat celery and celeriac that is chemically grown. The bugs love it and it's full of pesticides. The higher price for organic is totally worth it for carrots and celeriac. Some crops don't get bugs and the organic label is more for "show" than something that you must choose. Grated celeriac is dry and mild. I use it in my sushi recipes, but it's equally good grated for everything. It thins the blood, which is good for some and bad for others and cleans the liver, helping with gout, arthritis and a host of auto-immune diseases. You can also eat the leaves, but they are strong. Just as carrots come in other forms, so do beets. I do not use white, golden, or pink beets because they give me a sore throat, just as other roots in the chenopod family do. Pay attention to things like this. A golden beet might make your throat sore; a tea made with yellow dock might make your throat close up (happened to me.) Be careful when trying new foods, especially in the raw form. Try a little, then wait for a reaction. 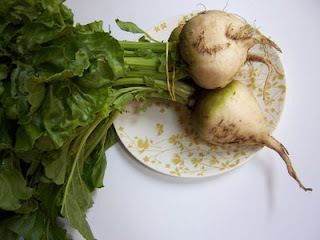 But white beets, both round like this and mangels (sugar beets) are an alternate white root crop for fun. But if you find the taste of red beets to have a strong, "beety" taste, white are even stronger! They are good mixed with other roots, and again, the leaves are as good as spinach or chard. Many people have seen jicama roots, which look like large, brown turnips on steroids. They are delicious. Many bean crops have edible roots. I'm showing you the foliage and flowers here, because, although the roots are wonderful, the seeds are poisonous. Many bean seeds are more or less poisonous, which is why most of them are cooked. If you eat raw, there are seeds you can eat as well as green and seeds you can't, like American common beans (although green beans are okay.) 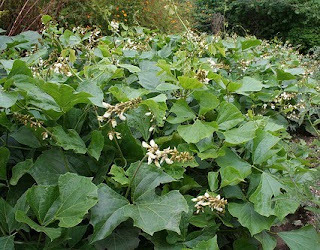 Jicama, like kudzu, is a tropical crop, so the roots are coming in from Mexico. They are a juicy root and a great nibble. But if you have gas problems with beans, jicama might give you gas. They are full of indigestible starches that bother some and don't bother others. Another "gassy" root crop are the roots of the sunflower family. 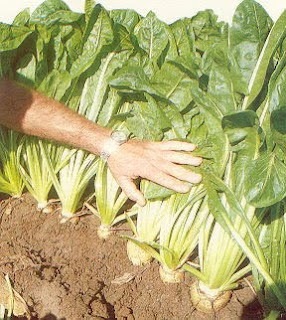 This is a picture of chicory, which grows a fine root. Other familiar roots in this family are sunchokes (jerusalem artichoke), burdock and many, many wild crops like balsam root and Oregon sunflower. They are tooted as a good root for diabetics because the carbs are in the form of inulin, which is indigestible, thus they are low in sugar. Some people do fine with inulin; for others it is a nightmare of gripe and gas. Eat a little bit first. Cooking does not help, unlike with beans. But chicory and burdock and dandelion roots are unparalleled as liver cleansers, excellent for gout and other diseases of toxic blood. Beware though, of another problem. If you have ragweed allergies, do not eat anything in this family: lettuce, chicory, sunflower seeds, are all going to aggravate it. But for most people, the roots of these crops are easy to grow, giving edible leaves and seeds, are healthy and make a crunchy root for eating out of hand or grated. 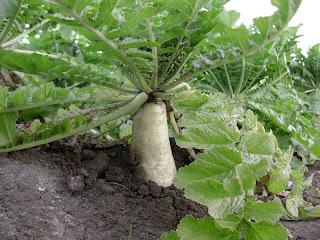 Here is the other most famous of the root crops, roots from the cruciferae family: radish, turnip and rutabaga. The hot spices are found from horseradish and wasabe which are both roots in this family. Mustard is from the seeds. Radishes, like these daikons, practically grow themselves. They are very weather resistant. But, bugs love them, so go with organic. Daikons and other radishes come in a hundred varieties, some red and green, many with colored skins from red to green to black. Daikon radish is delicious raw and is a staple in sushi bars. But if you have a sensitive stomach, almost everything in this family may give you gas. So go slowly at first. Most people get used to this family after some time being raw, others do not. One of my favorite roots is a weed. And I mean a weed. If you've had problems with campanula in your yard, you know that even the tiniest piece of root will grow into a hundred monster plants. Why? Well, it's also known as rampion and rapunsel and was bred to be a plentiful, cheap root crop like radishes. People stopped eating it, why? Only Rapunsel's mother knows. She had to forfeit her baby for stealing the greens from her neighbor's yard. Rapunsel is mild and crispy. It's relative, platycon or balloon flower is as pungent as radishes and is found dried in Korean grocery stores. But Americans don't grow it or eat it and you can't even find a picture of it, only an old drawing like this. So sad. The flowers, leaves and roots are edible, some better than others. Plants for a Future Database has a long list of the best of the campanulas to try, but you must grow them. Italian seed houses still sell the seeds of rampion, but to get seeds, you may have to go to English seed houses for wild and native plants. Or check your backyard. The campanulas have wonderful purple bellflowers or harebells--yep, same plant. But some have almost no root and others, these thick crunchy, yummy roots. Okay, enough on roots. Time for a winter dish! Marinate a handful of shitake mushrooms. (Do NOT use the regular button mushrooms or criminis or portobello mushrooms which are not good for you raw.) Most mushrooms are not good raw, so stick with the ones recommended, like shitakes. For an Asian dish, you can use some soy sauce. I'm allergic to it, so I've used a little bit of fennel here for a more Italian taste. This dish is fun, filling and good! Experiment, have fun, give your kids blue food! Hah.